The largest global sports media property in Asian history, ONE Championship™ (ONE), recently held the official ONE: A NEW ERA Open Seminar & Meet and Greet featuring ONE Championship superstars Demetrious “Mighty Mouse” Johnson, Eddie “The Underground King” Alvarez, and Angela “Unstoppable” Lee. The event was held on Monday, 21 January at Gold’s Gym South Tokyo Annex with media and students in attendance to take part in the activities. Johnson, Alvarez, and Lee each gave a martial arts demonstration featuring their favorite techniques. It was followed up by a warm-up pad session and then by a Question & Answer portion. Ticket information for ONE: A NEW ERA is available at www.onefc.com and on LINE Ticket at https://ticket.line.me/sp/ONEChampionship as well as Kyodo Tokyo, Ticket Pia, Lawson Ticket, and E-plus. Women’s mixed martial arts sensation “Unstoppable” Angela Lee is the reigning ONE Women’s Atomweight World Champion. Lee made her professional mixed martial arts debut with ONE Championship in May 2015 and has since been on an absolute tear, railing off nine straight victories, seven of which have come by spectacular finishes. At ONE: A NEW ERA, set for 31 March at the Ryogoku Kokugikan in Tokyo, Lee moves up a weight class to challenge ONE Women’s Strawweight World Champion “The Panda” Xiong Jing Nan for a chance to become a simultaneous two-division ONE World Champion. Multiple-time mixed martial arts World Champion Eddie “The Underground King” Alvarez and pound-for-pound great Demetrious “Mighty Mouse” Johnson are ready to make their highly-anticipated ONE Championship debuts. Alvarez is a mixed martial arts legend who has competed for the world’s top mixed martial arts promotions. The experience he has gathered over a stellar 15-year professional career so far is beyond impressive, with wins over some of the biggest names in the sport. Alvarez’ most notable victories have come against the likes of Roger Huerta, Shinya Aoki, Gilbert Melendez, Anthony Pettis, Rafael Dos Anjos, and most recently Justin Gaethje. 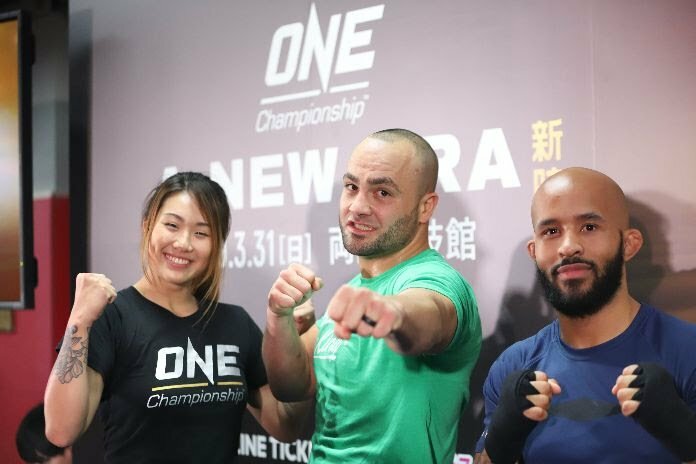 Recognized for his well-rounded skills and unwavering will to win, Alvarez will make his ONE Championship debut at ONE: A NEW ERA against Russia’s Timofey Nastyukhin. Johnson, on the other hand, is a mixed martial artist considered one of the greatest of all time in the history of the sport. With a highly-technical style and world-class skills, Johnson has dominated his division for the past six years. During this span, Johnson captured the flyweight World Title and ran up a win streak of 13 bouts since 2012. Today, he is widely considered the best mixed martial artist in the world pound-for-pound. Johnson will make his ONE Championship debut at ONE: A NEW ERA against Japan’s Yuya “Little Piranha” Wakamatsu. ONE: A NEW ERA is set for 31 March at the Ryogoku Kokugikan in Tokyo. It is ONE Championship’s first ever live event in Japan and the most exciting card of the year. In the main event, reigning ONE Lightweight World Champion Eduard “Landslide” Folayang of the Philippines defends his title against Japanese martial arts legend Shinya “Tobikan Judan” Aoki.